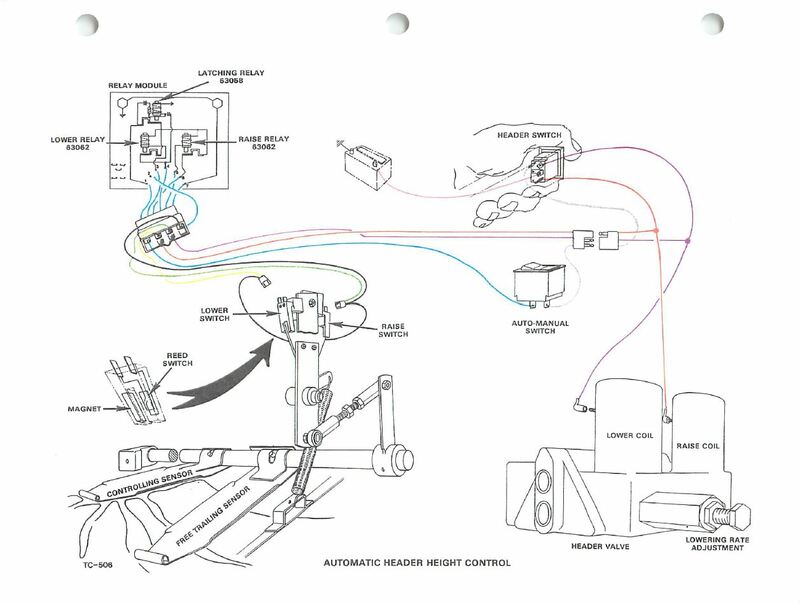 Anybody have a diagram and/or a description (or a link to) of how the auto header height works on the MF 760. I'm trying to get it working in the shop. The head sensor switches are definitely good, I have hooked up 12V to those and verified operation. It seems like I am not getting 12V to the head sensor switches. The wiring from the control box to the head is verified good. What all has to happen to activate the control? The up/down switch on the variable speed control handle is working. I have tried the enable switch for header height control in both positions. This was working when the combine was last run a few years ago. P.P.S. : I am now a little suspicious of the latching relay, I read open circuit (infinite resistance) between all four terminals. Last edited by jogl; 12-06-2018 at 12:14 PM. SHould definitely have a coil resistance between some of the pins. Could you take a photo of the schematic and post it? I collect AHHC schematics, and don't have that on yet! I have the 750 diagram "relay module" with 7 wires, but sounds like yours is different. Also, if I have the schematic, I can probably suggest some other test steps. Last edited by Jeff-C-IL; 12-06-2018 at 02:25 PM. I took the aluminum cover off of the relay and found a couple of diodes in there too, so that is why there was no resistance reading. The coil does work and engage the relay, but I still do not know if the relay is working properly. I also swapped the up and down relays which made no difference. The drawing that I found online is, hopefully, attached. OK, that is the same thing I has. Just didn't know you could "open the cover" so to speak. I would suggest you test the wires to see what you are getting there. 2) make sure pin 6 (the orange wire) is 12V when header raise is pressed. 3) make sure pin 1 (the light blue wire) is 12V when the Auto switch is in Auto and the Header switch is Centered or in lower. This will(or should) latch on the relay and provide 12V to the other two relay coils. 4) Pressing Header Raise or shutting off the Auto switch should remove the 12V from the light blue wire. 6) the yellow (pin3) and green (pin 4) wires should pull down to ground when the sensing plate moves out of the sensor U, allowing the magnet to close the reed switch. 7) Grounding the yellow or green wires will turning on the respective relay, outputting 12V on the orange or purple wire. Thanks for the information, a few things make sense now. Everything checks out until step 6. There is no 12V on pins 3 and 4 no matter what I try. SLight correction, the Green wire is pin 5. Those wires whould be 12v when the switches are not "turned on" as noted above. The 12V come thru the raise and lower coils from the output of the latching relays. So if you have no voltage on 3 or 5, that can only mean 1 of 3 things. 3)the latching relay is not turning on, or has a bad contact. 3) Does the Blue wire have 12V? If so, 4). If not, find out why. 4) Measure the output of the latching relay (the internal connection point shown on the drawing). DOes it have 12V? If so 5) If not, find where you are losing it between the blue wire and that point. May need to replace the relay. 5) Measure pins 3 & 5 again. Are they 12V? If so, find out where the wires are shorted on the header. If not, the raise and lower relay coils are broken. Last edited by Jeff-C-IL; 12-07-2018 at 09:46 AM. I had concluded that the latching relay was bad, so I was working on finding a way to temporarily whim wham a switch in to turn the auto control on and off, when I discovered the problem. The connectors on the circuit board that the relay terminals fit into were loose.